Capstone wrap-up: ACLTC's eighth cohort has graduated! We can hardly believe our EIGHTH cohort of web developers has just graduated from Anyone Can Learn To Code! 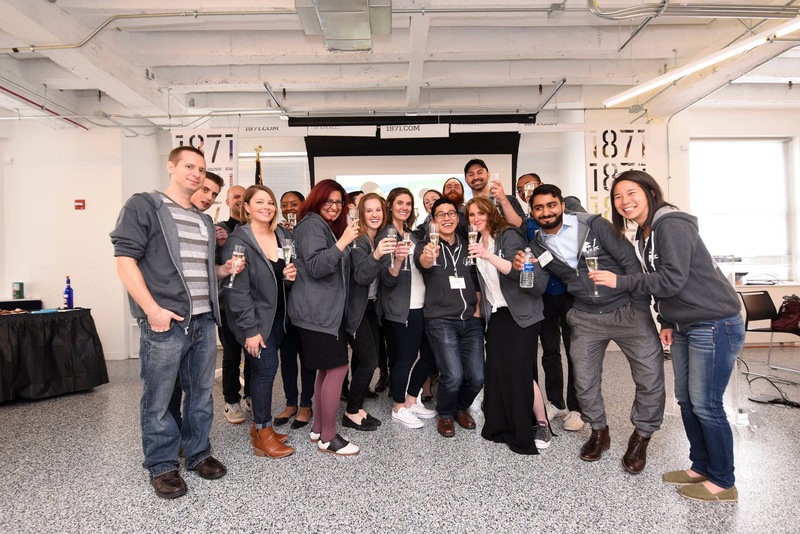 The Chicago Showcase took place on May 20th at 1871 Chicago and marked the end of our latest grads' 15 weeks of bootcamp. Next week, they'll begin their apprenticeships with The Difference Engine, where they'll work on projects for clients like Women Who Code and Just A Break. If you attended last week's Showcase, you probably got a personal demo of each of these apps! For those who missed out, read on to learn more about what our grads can build with their new skills. ProjectPet is an app that connects individuals in search of a new pet with local shelters. Through an API, users have the ability to scan a photo of a particular pet they are interested in to find a match in their area. myBallot helps users determine which candidates are most closely aligned with their values by allowing them to take a quiz and compare candidates to each other. The website also allows users to create a ballot with all of their ideal candidates to reference once they go to the voting booth. Team Townhall is a social and project management platform to help users develop hyper-local partnerships in their communities. Further, it can connect members to relevant government and corporate entities interested in participating in those communities. The Refuge helps solve some substantial problems that refugees coming from war-torn countries must face when immigrating to the US, such as language barriers and how to navigate complex systems like healthcare and education. The Refuge is a resource for refugees looking for help and the sponsors looking to help them which allows users (refugees) to track and map resources (DMV information, free clinics, ESL classes, and more) and remain in contact with their sponsors. Oyster is a travel-planning app that helps users keep track of ideas for future trips. Users can create trips, add ideas to each trip, and see where everything falls on the map. Newtri automatically queues patients waiting in doctors' o ices, emergency rooms, and urgent care clinics based on the severity of their conditions. It then keeps track of every patient and how long they have to wait to be treated. EMTs and prospective patients can then see how long they would have to wait at any given ER in real time. It utilizes machine learning to help with more accurate symptom diagnosis and to predict real-time wait times. Be Well allows users to search for doctors based on many variables so they can find the care and treatment solutions that best fit their needs. Using APIs to provide a thorough results list through dynamic search functions, the app allows users to view details about doctors and practices and make more informed decisions when choosing their care providers. Minerva is a lesson planning and curriculum evaluation software tool, developed using user-centered design processes and practices. Minerva allows teachers to collaborate on and design high-quality instruction and principals to give feedback on their plans. Sweet Tweet is a marketing suite for Twitter. It provides tweet analytics across a time frame that Twitter does not. A ranking system calculates attributes of each tweet and gives it a score so marketers can easily see which tweets perform the best. Sweet Tweet also includes a tweet auto-composer that creates a tweet simply by submitting a URL. Soccerwatch is a web app for soccer fans to find out which soccer pubs are showing which games and when. Users can easily find all locations on a map, read and write reviews, add games to a personalized calendar, and share with friends. Sound City is a resource for musicians that want to collaborate with each other. With Sound City, users can create a profile expressing their preferred genres, the instruments they play, and what they want to achieve with others, then search via genre or instrument to connect with other musicians in order to cultivate both friendships and music collaboration. Users can directly chat with each other and set up events to jam or simply attend shows together, ultimately bridging the gap between entering a music scene and meeting other musicians that want to play. Scout is a web application that centralizes the trip-planning to one location, preventing important information from slipping through the cracks. The core functionality allows a user to upload options for accommodations, flights, etc. to their trip's page where other members of the group can then vote based on their preferences in each category. Finalized plans are added to a formatted itinerary as well as a map showing the trip route, both of which can be accessed offline during the trip as points of reference. Strobe is a database for photographers and producers to search for and hire assistants and digital techs in their areas based on specific search queries. Photographers and producers may also post jobs to find and book assistants and digital techs. The app also offers a reference guide and troubleshooting tips for assistants and techs while on set. Lyceum provides a platform for educators to help facilitate active, streamlined communication and discussion amongst students, similar to a literature circle in a typical English class. DINE. is a reservation app created to allow diners to reserve a table at a restaurant and allows both the diners and the restaurants to manage reservations. The app confirms reservations with the diner via text message and updates the available time slots in real time.